One of my favourite places to eat in the city is Gen Creative. The flavours are great, the setting is relaxed yet classy, and the prices are reasonable, too. You can see some of my previous pictures either here, or here. Beautiful presentation on the plate here. I am a fan of a nice, crispy radish cake (蘿蔔糕), and this one did not dissapoint. Crispy on the outside, and soft on the inside, the radish cake packed flavour. The cubed chorizo added a great texture, and the fermented pepper sauce (the red sauce) added a nice sweet peppery flavour to bring it all together. Delicious. That’s not to say it wasn’t good, but I think I was just thinking too much about last years incredible octopus. Served with crunchy toasted chickpeas and creamy, earthy hummus and squares of salty feta cheese, the octopus was served at room temperature. It was tasty, but didn’t quite ‘wow’ me the way I hoped it would. 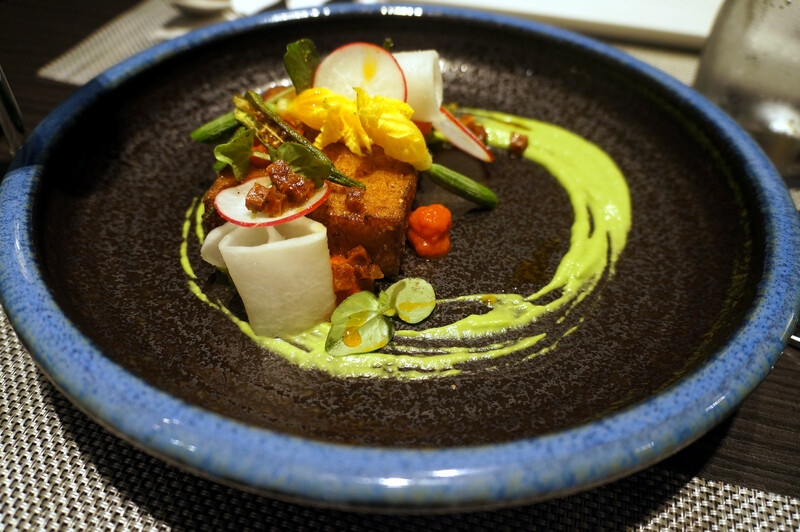 A perenial dish at Gen Creative, the Bossam is a delicious creation. We had this the first time we went to Gen Creative two years ago. It was delicious then, and it was delicious this time, too. Pick up a slab of perfectly cooked pork belly, sandwich it in a lettuce leaf, add a sliver of pickled radish and kimchi, then dab a bit of that spicy and salty sauce that the pork is sat on – delicious! A unique and brilliant dish by Gen Creative. You’re going to get two ice cream balls flavoured with rice milk, and one of soy milk. Accompanied by a green onion/scallion madaleine, with deep-fried dough stick filled with custard. I was surprised, and it was really pretty good. It’s a sharer, that’s for sure, I don’t think I could tackle this alone! If you know a better Souffle in Taiwan than this, then you absolutely must get in touch with me. This is seriously difficult to beat! Grand Marnier and chocolate flavoured souffle is cooked to perfection, and accompanied by a passion fruit ice cream with small cubes of persimmon sitting at the bottom. The alcohol flavour is there, and it’s perfectly balanced. You must order this.